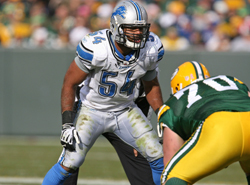 During the 2009 offseason the Lions overhauled their linebacking corps by adding five-time Pro Bowler Julian Peterson, Detroit native Larry Foote and drafting DeAndre Levy and Zack Follett. Throw in incumbentErnie Sims and the Lions appeared to have rebuilt that position for the next few years. Two years later Levy is the only player expected back on the team after Sims was traded and Foote left in 2010, Peterson will be cut this offseason and Follett may have suffered a career ending injury. The Lions’ linebacking corps took a huge step backwards in 2010 while the line and secondary made strides forward. The run defense improved, but the defensive line’s excellent play against the run was negated by poor play on the second level. The secondary was improved, but the Lions struggled with defending the intermediate pass because the linebackers had issues in coverage. Jim Schwartz’s defense has the defensive line split wide to contain running plays and funnel the ball back to the middle of the field. The line is also asked to attack the quarterback and force quick throws into zone defenses played by the back seven. The scheme is reliant on athletic linebackers that quickly diagnose plays, fill their gaps or drop into their zones and tackle well. The 2010 Lions had one linebacker that fit that mold and the defense’s performance suffered because of that. Julian Peterson: Peterson was an interesting pickup for the Lions in 2009 because of his versatility and pedegree. Peterson was a five-time Pro Bowler who was an elite pass rusher, excellent in coverage and a strong tackler. He fortified the Lions defense in 2009 and there were high expectations of him in 2010. Peterson’s performance saw a sharp decline that culminated in him being a healthy scratch for the final game of his Detroit career. In watching film of Peterson in 2010 it’s not easy to determine the cause of the dropoff. Peterson turned 32 just before the start of the season, which initially led me to believe it was his age catching up to him, but the more I watched the more it looked like mental mistakes and a lack of effort. The Lions were expected to ask Peterson to take a paycut before the 2010 season and he insisted he’d say no if they did. It’s quite possible that Peterson knew 2010 was his last year in Detroit and just checked out. The fact that the coaches benched him and came as close to making negative comments to the press as they ever have, lends credence to the decline being more mental than physical. 2011 Outlook: Peterson has already been informed he will be cut this offseason. 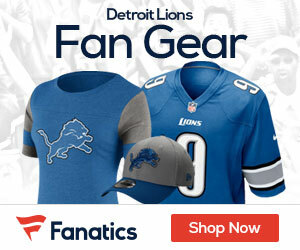 DeAndre Levy: DeAndre Levy missed five full games and part of a sixth with a groin injury that required surgery after the season ended. Despite being hobbled all year Levy had an incredible season logging 72 tackles, 4 passes defended, 2 fumble recoveries and two interceptions including one returned for a game winning touchdown. Levy has a nose for the football and a knack for making big plays. In 27 career games he’s picked off 3 passes, forced a fumble, recovered 4, scored a touchdown and made several huge stops on third or fourth and short situations. Levy has elite speed for a middle linebacker and great instincts. He’s a little smaller than the ideal middle linebackers, but he understands leverage and does well shedding blocks. He is instinctive in coverage and is comfortable in space, but his tackling technique needs work as he misses his fair share of tackles. Levy also brings position flexibility after playing on the outside in his rookie year. 2011 Outlook: Levy is the linebacking corps’ young building block player, he will hopefully be a fixture in the middle for years to come, but he has struggled a little with injuries in his first two years. Zack Follett: Follett was a seventh round draft pick in 2009 that immediately found himself in Gunther Cunningham’s doghouse in training camp. Follett landed on the practice squad until he was brought up to the active roster in October. He immediately became a fan favorite after delivering several massive hits on special teams and connecting with the fans on social media. Follett not only got out of Coach Gun’s doghouse, but earned his way onto the field on defense in the season finale. Follett rode that momentum into the 2010 offseason where he became one of the starting outside linebackers after Ernie Sims was dealt. Follett has a non-stop motor but he didn’t distinguish himself in his starting role. After doing some film study I noticed I always had to look for him, he never stood out on his own. Jumping from a 7th round pick to starter in the NFL in one year is good progress and perhaps with time Follett may have grown into that role. 2011 Outlook: Follett suffered a potentially career ending neck injury in Week 6 and is a longshot to ever return to the field. Ashlee Palmer: Palmer was claimed of waivers in February of 2010 as a developmental linebacker and special teamer. Palmer fell into five starts in 2010 and displayed potential and he was a special teams stalwart all season. Palmer had a productive preseason and had a pair of excellent starts during the regular season as well. Palmer has the size and athleticism coaches love, but it’s a matter of consistancy for him. 2011 Outlook: Palmer showed enough promise as a backup to be worth keeping around and his contributions on special teams should help him make the roster. Palmer is nothing more than a spot starter and special teams guy at this stage, but in a year or two he could develop into a starting caliber player. Bobby Carpenter: Carpenter was signed in October after being cut by the Dolphins. Carpenter was drafted to play outside linebacker in the 3-4 in Dallas despite playing in a 4-3 in college. Carpenter was a bust for the Cowboys and was traded to the Rams, but didn’t make it through final cuts. Bill Parcells drafted him in Dallas and signed him in Miami to play in their 3-4. Carpenter’s skill set never really fit the 3-4 and he looked more comfortable in the Lions 4-3. Carpenter didn’t have the benefit of training camp or offseason workouts, he was thrown into the mix on special teams and as injuries mounted got more playing time on defense. 2011 Outlook: Carpenter should be back in 2011 in a backup and special teams role. The Lions will look to upgrade both starting OLB spots, but with a solid offseason Carpenter could be in the competition if he reverts back to college form. Landon Johnson: Landon Johnson was a favorite of special teams coach Danny Crossman when he was in Carolina so the Lions brought him aboard shortly after. Johnson was a starter with the Bengals for a few years before signing with the Panthers. The Lions got a lot of steady production from Johnson, but he is little more than a spot starter and special teamer. Johnson has never been one for making big splash plays, but his versatility has proven valuable. 2011 Outlook: Johnson ended the year on IR and had concussion issues last season. The Lions would like him back in camp to compete if he’s healthy. Isaiah Ekejiuba: Ekejiuba was signed strictly as a special teamer and he paid dividends when he was healthy. In 2009 he was a Pro Bowl alternate for the special teams position and he was on track for another shot but knee injuries derailed him in 2010. 2011 Outlook:If healthy Ekejiuba will have a chance to compete for a special teams position and will more than likely win it. Jordon Dizon: Dizon didn’t play a down in 2010 thanks to a season ending injury in preseason. Dizon was starting to turn the corner in the offseason and training camp and also saw increased playing time in obvious passing downs. 2011 Outlook: Dizon isn’t an ideal fit for the defense, but he contributes on special teams. There’s a good chance he won’t be back, but since he never got on the field it’s hard to say what the coaching staff thinks of him. Vinny Ciurciu: Ciurciu is a special teamer for hire and offers very little other than that. 2011 Outlook: The Lions have a number of linebackers that contribute on special teams and can fill a backup role. Vinny isn’t one of them and isn’t expected back. 2011 Offseason: The Lions need two starting outside linebackers this offseason and they will definitely have options on the free agent market. There are a number of young linebackers that fit what the Lions are looking for and should be available because they don’t fit their current teams’ scheme. Rocky McIntosh, James Anderson, Stephen Nicholas and Thomas Howard are a few that could be attractive. The Lions will definitely look in the draft to fill the other opening. As it stands now, the first round pick looks to be outside of the linebacker range for the Lions with prospects either expected to go before the Lions’ pick or be a reach with the 13th pick. The draft isn’t top heavy for linebackers but there should be some good value in the 2nd and 3rd rounds and the Lions hit it big with one 3rd round linebacker already.